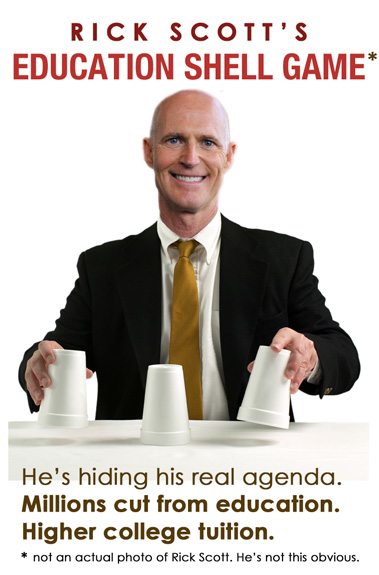 Tallahassee, FL — Rick Scott's playing a game with Florida voters — the kind of game they can only lose. For two years he cut hundreds of millions from public schools and colleges, while cutting scholarships and raising tuition by double digits. But now that voters are about to hold him accountable, he's hiding his real agenda and talking big talk about education — but it's just a shell game. Scott Cut $1.3 Billion from Education, $300 Million from Universities. Rick Scott Approved Hiking Tuition 13%. Scott Signed 20% Drop in Bright Futures Scholarships Into Law.